Heather McCargo, founder and executive director of the Wild Seed Project, kneels by blue irises in bloom on June 17 in her garden in Brooksville. The irises are native to Maine and are one of 60 species of plants sold by the Wild Seed Project in seed form. Heather McCargo, founder and executive director of the Wild Seed Project, points out a jack-in-the-pulpit plant in her garden in Brooksville. Jack-in-the-pulpit is native to Maine woodlands, swamps and thickets. It is one of 60 species of plants that the Wild Seed Project sells in the form of seeds. 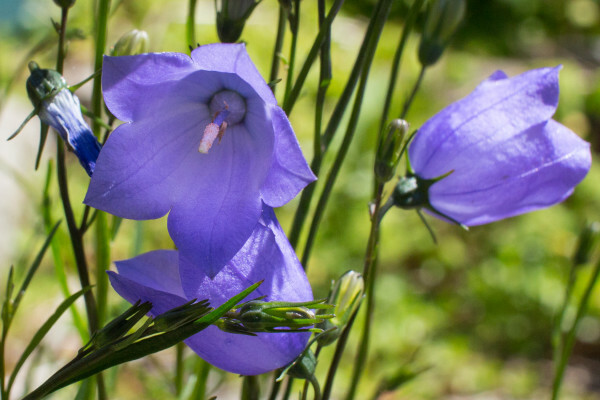 Scotch bellflower is in bloom on June 17 in Brooksville, in the gardens of Heather McCargo, founder and executive director of the Wild Seed Project. Scotch bellflower is one of 60 plants sold by the Wild Seed Project in the form of seeds. Native to the Maine landscape, these flowers prefer sunny, rocky soil, the shoreline and dry meadows. 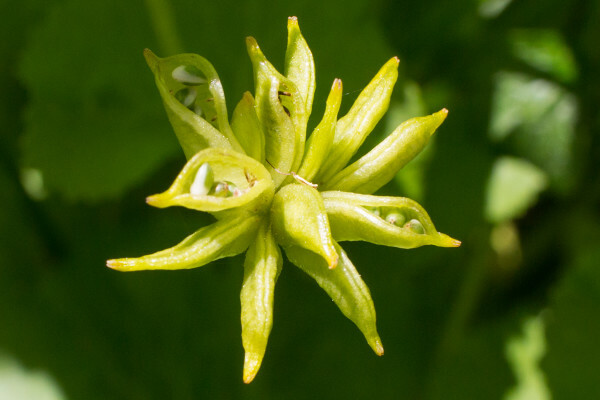 The seed pods of marsh marigold are beginning to split on June 17 in Brooksville in the gardens of Heather McCargo, founder and executive director of the Wild Seed Project. 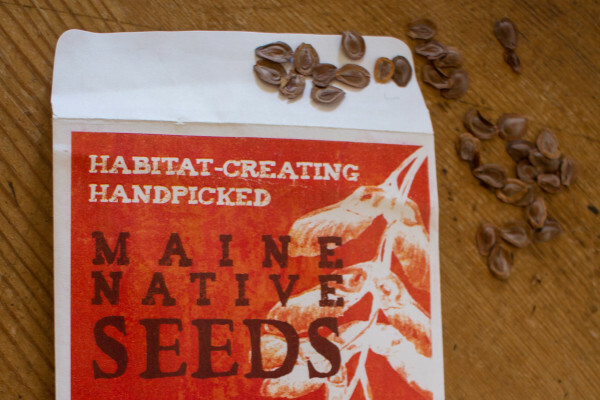 McCargo collects the seeds to sell online through the Wild Seed Project, a nonprofit with the mission to re-introduce native plants to the landscape and increase biodiversity in the state of Maine. The Wild Seed Project is a Maine nonprofit organization that provides people with information about growing native plants in their gardens and around their homes. The organization also has an online seed sale of up to 60 different species of plants native to the area. Growing from the damp forest floor, jack-in-the-pulpit thrives in shade or sun. A woodland perennial native to Maine, this plant produces a distinctive hooded flower, striped with green and brown and sometimes purple. Many Mainers know it by sight. Pollinated by small flies and gnats, its flower slowly shrivels throughout the summer, making way for a bundle of green berries that ripen into a vibrant red. The berries are then plucked up by wild turkeys and wood thrushes, mice and box turtles. “Every native plant has at least one creature, if not several creatures, that is dependent on it,” Heather McCargo, founder and executive director of the Wild Seed Project, said. A Maine-based organization working to return native plants to the landscape, the Wild Seed Project was founded in 2014 by McCargo and has been growing ever since. Jack-in-the-pulpit is just one of the many native plants the nonprofit organization showcases through its website, annual magazine called Wild Seed and online seed sale. The bottom line of the Wild Seed Project is to conserve biodiversity in Maine through the sowing of wild seeds. 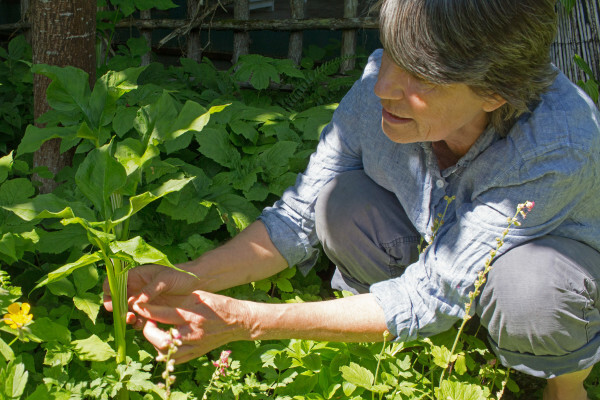 At her house in Brooksville on June 17, McCargo pointed out the many native Maine plants she uses to produce garden beds full of interesting colors and textures. “A lot of our garden plants aren’t great pollinators,” she explained, referring to the greenhouse-raised flowers typically seen in Maine gardens — the showy hydrangea and bright rhododendrons, the tall day lilies and countless colors of roses. 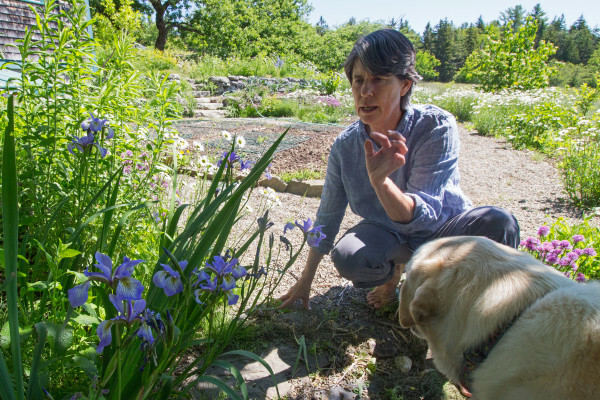 Instead of using these flowers, McCargo fills her gardens with native Maine plants, such as jewelweed and marsh marigold, American honeysuckle and wood aster, eastern shooting star and red columbine. Instead of growing a patch of asparagus, she grows a patch of ostrich ferns, commonly known by Maine residents as edible and tasty fiddleheads. Early in the season, several of the woodland plants in her garden were already in full bloom. Big blue irises stretched the petals wide, displaying a wash of yellow, purple and indigo. And Turk’s-cap lilies bent their orange heads in the sun, their spotted petals curled back, tempting bees and butterflies. A former head plant propagator for the New England Wild Flower Society, McCargo describes herself as an educator with 30 years of experience in plant propagation, landscaping and conservation. Splitting her time between her home in Portland and her house in Brooksville, she now is devoting most of her time to the Wild Seed Project. On the organization’s official website, wildseedproject.net, she writes articles about specific gardening topics. And with the help of volunteers, she ethically collects seeds to sell through the website. Running year-round, the seed sale is replenished each November, when McCargo adds the year’s seed crop. At that time, her product list includes about 60 species of plants native to Maine. On the Wild Seed Project website, people new to gardening can learn the simple steps of propagating native Maine plants. To decide what plants will best grow on their properties, people can read “Plant Profiles,” written by Pamela Johnson, a landscape gardener from Sedgwick who serves as president of the Wild Seed Project. Pausing at a patch of milkweed, McCargo explained that the monarch butterfly — a once abundant and iconic creature of summer in Maine — depends on milkweed to survive. This species of butterfly has recently seen a dramatic drop in population, and a lack of milkweed on the landscape of North America has been cited by biologists as a contributing factor. Maine is home to four native species of milkweed, McCargo said, and the Wild Seed Project collects and sells the seeds of all four. Teaming up with local organizations, such as the Maine Audubon, the Wild Seed Project leads native plant walks and workshops on topics such as seed collection and edible wild plants throughout the state. To learn more about the Wild Seed Project, shop the seed sale and view the organization’s schedule of events, visit wildseedproject.net.